Sharon and I made it up to Washington State where I led a two day seminar and spoke Sunday morning at Islands Community Church in Friday Harbor. We were hosted by my Junior High and High School friend Dale and wife Patty Pratt, and the seminar was organized by Light and Power House (early days ministry at UCLA) former student Gary Covington. There’s is nothing sweeter than long time friendships. The focus of the workshop/seminar was “A Ministry Paradigm and Practical Ministry Tools from the Book of Romans. Paul says in his introduction that he wrote Romans “in order to have a harvest” among the Jesus followers in Rome (Romans 1:13). Romans is the outline that Paul will expand upon when he travels to Rome and is with them in person to do that. The rest of the book unpacks the power for salvation of the Gospel. 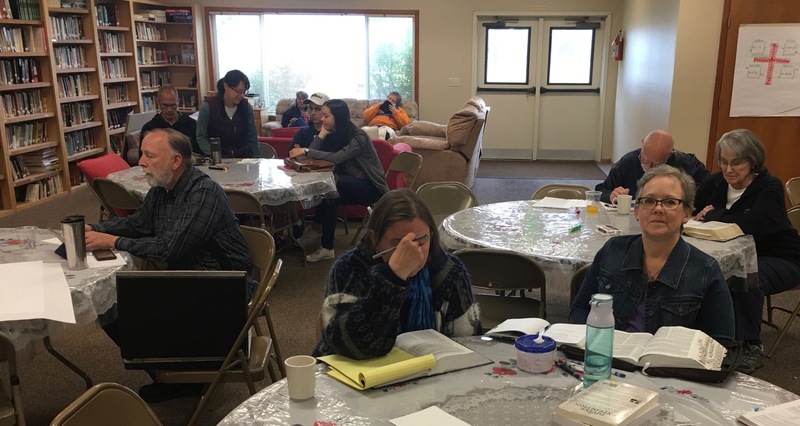 In our workshop (and Phase 1 training internationally), we worked our way through Romans, not only looking at what Paul taught (the paradigm of ministry), but also what he evidenced (practical ministry tools) in what he wrote. We believe Romans (as with all of Scripture) it is meant to be interpreted literally, historically, and grammatically, and relationally, redemptively, and missionally. Paul not only grounded Christ-followers in the basic truths of the Gospel, but he also sought to equip and strengthen them in a practical ministry. 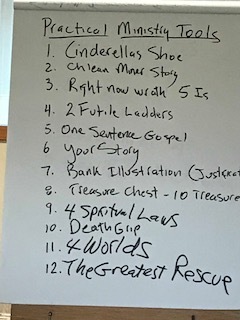 “Cinderella’s Shoe” and “the Chilean Miner Story” are drawn from Romans 1:1-17. The “Right Now Wrath of the 5 Is” (that’s the capital letter I) are found in Romans 1:18-31. The “Two Ladders of Futility” are found in Romans 2:1-3:20. The “One Sentence Gospel” is from Romans 3:21-22. The “Bank Illustration” is the bridge from Rescue to Restore in Romans 5:1. The “Treasure Chest” is in Romans 5-6, and 8. The “Death Grip” is from Romans 7. “4 Worlds” is from Romans 9:1-5. “The Greatest Rescue” is drawn especially from Romans 10. These are just some of the practical ministry tools to communicate the Good News of Jesus that we glean and adapt from Romans. It is exciting to see people view Romans through a different lens, and get excited afresh about the Gospel and reaching and restoring others. 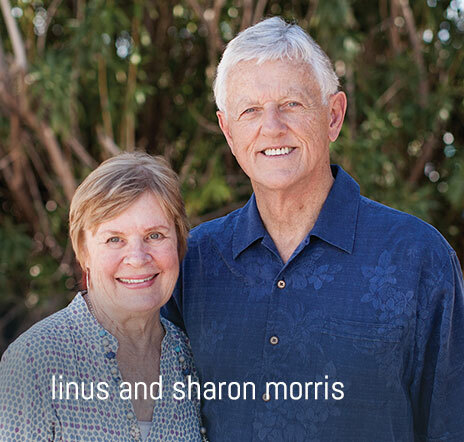 Following our time on San Juan Island, Sharon and I will drive to our daughter Kristin and Son-in-Law Cory’s home in White Salmon, Washington, where after a few days I leave Sharon, and travel on to Los Angeles. There, I will join Phil Graf and fly to Brazil where with our Brazilian Divine Expedition team led by Sammy Diab, we will train leaders in two states and six cities. Please pray for Sharon while I am away…and pray that our training will bring much fruit, and that we will bring the sweet aroma of Christ wherever we go.